Braconid wasp of the subfamily Aphidiinae laying an egg in a hapless aphid. Photo from BioMed Central. We all know that J. B. S. Haldane is supposed to have remarked that God seemed to have an "extraordinary fondness for beetles". What Haldane may not have realised was the possibility that the beetles were just a means to an end. 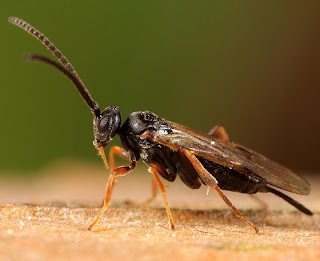 As the current rate of taxonomic description is considered, some researchers have come to the suspicion that the true objects of the Creator's affection are not beetles, but parasitoid wasps*. Which, when you consider the natures of parasitoid wasps, kind of explains some things about life. *Personally, I'm still taking the long odds and backing the nematodes. Microgastrinae larvae emerging from a host caterpillar. Photo from here. The Braconidae are just one of the stupidly diverse lineages of Hymenoptera (another group, the Proctotrupomorpha, was covered at this site here). According to ToLWeb (in 2004), there are some 12,000 described species of braconids, with estimates of up to 50,000 in total. Braconids form the living sister group to the similarly diverse Ichneumonidae, though braconids tend to be smaller in size (still, some of them are more than big enough). Braconids include both exoparasitic and endoparasitic taxa, parasitoids of eggs, larvae or adult insects, and a small number of gall-forming plant-parasitic taxa for added variety. The usual opinion is that the exoparasitic taxa represent the ancestral lifestyle for the family, but the actual phylogeny of the family is still being hammered out (and the "usual opinion" may yet turn out to be the wrong opinion). About forty subfamilies are currently recognised, but most authors (e.g. Shi et al., 2005) divide those subfamilies between three main lineages, the cyclostomes, microgastroids and helcionoids, with some subfamilies of uncertain position relative to the three. The microgastroids and helcionoids are all koinobiont endoparasitoids (after the wasp has laid its eggs in the host, the host continues to grow and develop), while the cyclostomes include both exoparasitoids and endoparasitoids, with exoparasitoids usually paralysing the host before laying their eggs (Wharton, 1993). The microgastroids are fastidious in their tastes, restricting their diet to Lepidoptera (Murphy et al., 2008), while helcionoids attack a wide variety of hosts, including hemimetabolous as well as holometabolous insects. Early phylogenetic studies suggested that the cyclostomes (which possess a distinctive mouthpart morphology) were paraphyletic with regard to the other braconids, but more recent studies support a monophyletic cyclostome clade (Shi et al., 2005). The monophyly of a microgastroid + helcionoid clade is supported by molecular data (Shi et al., 2005), but remains short on morphological support (Quicke et al., 1999). An individual of the genus Atanycolus (subfamily Braconinae in the cyclostome group). Photo by Richard Bartz. The Aphidiinae are the largest group of braconids to not fit comfortably within the three-way division. 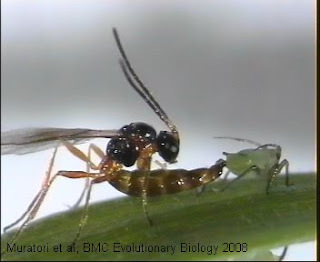 Aphidiinae are parasitoids of aphids. Morphological data supports a relationship between aphidiines and the cyclostome group (Quicke et al., 1999), but the molecular analysis of Shi et al. (2005) suggested a relationship between the Aphidiinae and the Euphorinae, members of the helcionoids. The intriguing feature of this result is that Aphidiinae and Euphorinae both have the unusual characteristic (for insect parasitoids) of parasitising adult hosts rather than larvae - albeit with different host ranges in the two subfamilies. 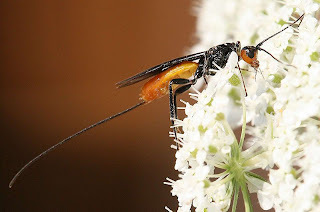 Euphorinae were probably originally parasitoids of beetles, but some species have since become parasitoids of hosts as diverse as grasshoppers or Psocoptera. (A more recent combined morphological and molecular study whose authors argued against an Aphidiinae-Euphorinae relationship in favour of an Aphidiinae-cyclostome connection [Zaldivar-Riverón et al., 2006] actually did not test anything either way, because the authors' choice of taxa and outgroup effectively forced an a priori cyclostome position). An adult of Microgastrinae. Photo by Scott Justis. Finally, some would think it rather remiss of me to write about braconids without making some mention of polydnaviruses, but I don't see why I should when a much better description of such things than I could produce has already been written by Merry Youle at Small Things Considered. After you read the main article there, though, make sure you scroll down the comments to Merry's description of the differences between polydnaviruses in Braconidae and Ichneumonidae suggesting the independent origins of the polydnavirus system in the two families. As well as the differences described by Mary, it also turns out that polydnaviruses are not characteristic of braconids as a whole, but are in fact only found within the microgastroid clade (Wharton, 1993), so an independent origin from ichneumonid polydnaviruses has phylogenetic as well as biochemical support. Murphy, N., J. C. Banks, J. B. Whitfield & A. D. Austin. 2008. Phylogeny of the parasitic microgastroid subfamilies (Hymenoptera: Braconidae) based on sequence data from seven genes, with an improved time estimate of the origin of the lineage. Molecular Phylogenetics and Evolution 47 (1): 378-395. Quicke, D. L. J., H. H. Basibuyuk & A. P. Rasnitsyn. 1999. Morphological, palaeontological and molecular aspects of ichneumonoid phylogeny (Hymenoptera, Insecta). Zoologica Scripta 28 (1-2): 175-202. Shi, M., X. X. Chen & C. van Achterberg. 2005. Phylogenetic relationships among the Braconidae (Hymenoptera: Ichneumonoidea) inferred from partial 16S rDNA, 28S rDNA D2, 18S rDNA gene sequences and morphological characters. Molecular Phylogenetics and Evolution 37 (1): 104-116. Wharton, R. A. 1993. Bionomics of the Braconidae. Annual Review of Entomology 38: 121-143. Zaldivar-Riverón, A., M. Mori & D. L. J. Quicke. 2006. Systematics of the cyclostome subfamilies of braconid parasitic wasps (Hymenoptera: Ichneumonoidea): a simultaneous molecular and morphological Bayesian approach. Molecular Phylogenetics and Evolution 38 (1): 130-145. Personally, I'm still taking the long odds and backing the nematodes. Someone, I forget who, suggested that every non-nematode animal species has at leaste one nematode species dedicated to parasitizing it and it only. Which leads to the question: are there any nematodes parasitizing other nematodes? 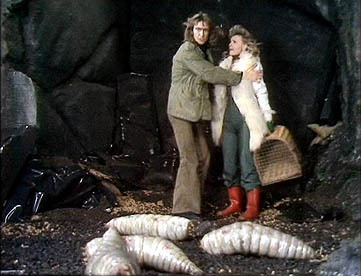 Andreas: I don't know of any nematodes parasitising other nematodes (and I suspect there might be physical limits preventing that), but I'm willing to be that there's nematodes that predate other nematodes. On the other hand, I'm getting the impression that in many cases the "host specificity" of parasites has been vastly over-estimated, so the "at least one parasite for every species" estimate might not work out so smoothly. Mike: I don't actually know what the specific derivation of "koinobiont" is. I'd guessed that it referred to the close association of host and parasitoid ("close" as in "Cenozoic"), but your suggestion makes even more sense. I'm wondering if parasites jump from one host species to another opportunistically -- i.e., my regular host doesn't seem to be here, let's try this random creature -- or just through failing to recognize that they are in fact jumping species, because they aren't terribly good at such recognition. (You might be able to test this by supplying mixed populations and seeing whether a parasite only attacks other species when there are none of its accustomed host.) Probably plenty of both, I suppose, depending on where you look. Are there really nematodes that only attack H. sap? 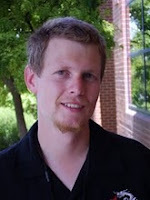 ncm: I would probably say that both factors (and probably more) occur, depending on parasite species, depending on mode of transmission, depending on all sorts of things. Host specificity seems to be a surprisingly difficult thing to predict some times. Among mites of the family Sarcoptidae (scabies mites), for instance, there are many species with very limited host ranges (usually a few closely related bat species - I don't know why bats have such an incredibly high diversity of parasites compared to everything else, but they do), but then you have species like Sarcoptes scabiei which are found on almost every type of mammal, including both placentals and marsupials. Of course, there are also issues with investigative bias - a parasite may not have been recorded from all the hosts it can infect. It looks like Ascaris lumbricoides might be human-specific, depending on whether or not it is truly distinct from the pig-parasitic A. suum. Another problem with the one nematode-parasite-per-species is, of course, that some invertebrates are very small. If host-specificity is so common, there must be some advantage to it. I imagine host specificity is really a side effect of adapting to an accustomed host's defenses with tactics that make it less well adapted to other possible hosts. It then has to learn to recognize the host that it has adopted (otherwise-) maladaptive characters on behalf of.